If your EK block works with Skylake, it'll work with Kaby Lake too. If you're attached to your current EK Water Block liquid cooling solution, but are worried you'll have to switch it for a new one when you upgrade your CPU to the new generation of Kaby Lake, then fret no more. EK has announced all of its current CPU water blocks fully support Intel's next generation of i5 and i7 processors out of the box. This will be happy news for EK users looking to make the upgrade to Intel's 7th generation processors, as water cooling is expensive to maintain and replace. 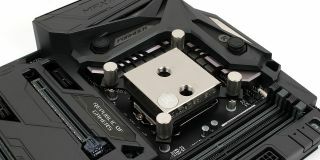 EK Water Blocks says that due to the same mounting holes pattern of the socket LGA-1151 based microprocessors, you won't need to buy any additional parts for the EK-Supremacy Evo (except the AMD C32/G34 and Elite Intel 2011-3 type), or the EK-Supremacy MX (except the AMD type). Also, all variants of the EK-Kit S, EK-Kit L, EK-Kit P, and EK-Kit X liquid cooling kits officially support Kaby Lake, as do all the variants of the all in one EK-XLC Predator unit. The company says it will be also announcing dedicated Monoblocks for upcoming Z270 motherboards which will become available during the next few weeks.